An interview with Karen Ball. Hello, I would have put this in my last blog post, but the interview has just gone live today. 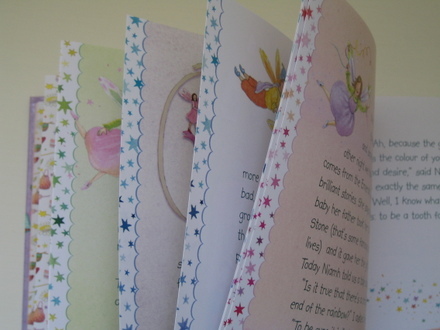 Karen Ball, children's author, has done me the honour of interviewing me about my work, for her blog. She has been very kind about me and my work, so naturally I'm very flattered, and she has also asked some interesting questions about the process of illustrating my books, which if you're interested in illustrating children's books, you might find of use in some way. If you'd like to read the interview, which comprises of six questions (just so you know it doesn't go on and on, it's a quick read, I know how busy everyone is), you can read it here. Hello! Here's a lovely little story for anyone feeling a bit down, a bit miserable because of the dark evenings, or generally not quite 100%. Something to sweeten your day, sweeten your tea, sweeten the next few minutes! Just before I start telling you all about this story I'm going to tell you about, it is going to be read by the actor Tristan Gemmill (who appears in the t.v. series Casualty), on CBeebies television programme at the bedtime hour tonight, 6.50 p.m. Exciting don't you think?! And the story I want to tell you about is my latest book, just published. It's the fifth book in the series of mole books I've done, and it's a very, very sweet story. These are the other books in the series. They all contain stories about mole conquering different situations, emotions, trials and tribulations, a bit like we all had to as children. In this book mole finds a out about sharing, which has to be one of the biggest issues to deal with in any childs life, from sharing a toy, to sharing a parent with a sibling. Sharing is a BIG deal. Sharing is a big deal in to adulthood too don't you think? So adults and children will relate to this story very easily. Would you like me to take you through the book, in a brief kind of way, as though you were casting your eye over it in a book shop? 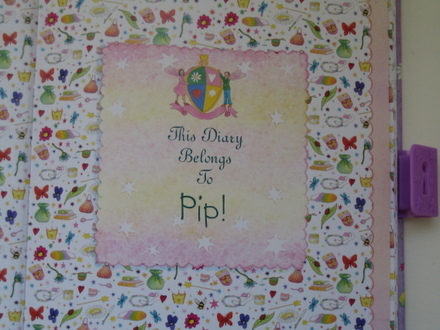 This is the front endpaper. I like to set the scene in the mole books with the front end paper, and finish off the story with an image on the back endpaper. There's mole coming out of his hole. It's such a beautiful day. Can you hear the low buzz of insects in the summer sun? Can you feel the warmth of the sun? The heat! It's too much for a small mole, even an energetic small mole. Mouse is a great little home maker, which mole thinks is rather amazing. You see that lovely soft moss she's got on the floor as a rug? I wouldn't mind curling up on that myself. Her leafy bed is somewhere I'd like to hibernate myself. And there's always flowers in mouse's house. Always. Mouse is a bit special. Mole thinks mouse is very special. They seem to have so much to talk about, so much in common. There's just one thing, mole has accidentally-on-purpose decided to keep mouse a secret from his pals. He wants her all to himself, and does not want to share her with his friends AT ALL. His friends wonder what mole is up to, and are nice enough to go searching for him, isn't that nice of them? But mole is nowhere to be found. The next morning mole's friends return, and find mole! Does mole tell his pals about mouse? No. Mole somehow neglects to tell his friends about mouse. So mole's friends get a bit of a surprise when they hear a sweet little mouse-like voice calling to mole. Check out the guilty, and also slightly worried expression, on Mole's face. Mole is very put out that mouse is so chatty and friendly with his friends. Mouse assures him that he'll always be her special friend, but it's so much more fun to share. So there you go, a lovely bed time story, a very much shortened version by me, Jonathan Emmett's words make the story much more magical. It's nice for me to go back to this book, as it's about a year between finishing a book, and it being published and appearing in book shops. I sort off forget about the books I illustrate when they're in no-mans land like that, finished, but not yet published. I'd better go, because I want to catch it being read on CBeebies. P.S. You can buy this book on amazon here (U.K. Amazon), here (U.S. Amazon). P.P.S. I just watched it on t.v. and not only is Tristam Gemmill rather delicious looking, but he read it really, really well. I was so exciting to see it being read, and see my pictures up on the television screen. I was watching it like it wasn't my book, and I was totally entranced! I've just got the link where you can watch it on iplayer for the next seven days, the link is here. Lovely! Have a wonderful weekend! Cheerio! The Sheffield Children's Book Award. Hello! We had a wonderful weekend away, celebrating my Mother-in-Law Susan's 70th Birthday. And then today I heard some fantastic news, so I'll wait for another day to tell you about our time away. That should probably read FANTASTIC news. 'The Pig's Knickers', written by Jonathan Emmett and illustrated by me, won TWO (!) awards at the Sheffield Children's Book Award yesterday. We won best picture book, and overall winner! You can see the listing here. The shortlist for all the categories is here. I did a blog post about this book earlier in the year, you can see it here. I am in shock, good nice shock, about this wonderful news. Jonathan Emmett and I won a prize for another book we did together, back in 2004, the first book in the series of mole books, 'Bringing Down The Moon'. It was the Kiekeboekprijs, in Holland, and we were flown over to Amsterdam for three days to go to the awards ceremony, and be interviewed by journalists. The publishers Van Goor accommodated us in a very, very nice hotel in Amsterdam, I had an enormous room, and the visitors book was full of the signatures of famous writers. I wasn't able to go to the awards ceremony for the Sheffield Children's Book Award, but Jonathan Emmett and my art editor Julie, (who I have worked with on most of my books for Walker Books), did go to the ceremony. Apparently Jonathan wore some great big spotty knickers over his trousers, to receive the award, wonderful! I hope the knickers Jonathan wore were identical to Pig's knickers. 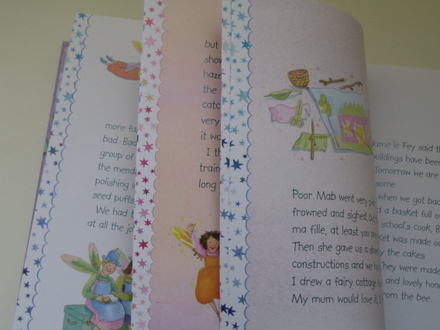 At the back of the book, is a page showing other books Jonathan has written and I have illustrated. But this is a little out of date now, as the fifth book in the mole series has just been published! There's some exciting news for this book too, because it's going to be on CBeebies bedtime hour next week, Friday 9th December. 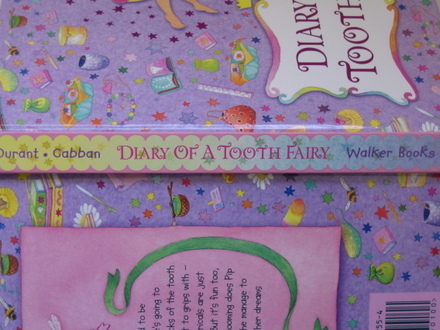 It is such a sweet, sweet, sweet story, this book, I'd like share it with you, and do a blog post about it next week. And these books, are they for sale? Yep, they are indeed, perhaps in your local bookshop, or on amazon. You can buy 'The Pig's Knickers' from amazon here (UK), or here (USA). And 'A Secret Worth Sharing' is available from amazon here (UK), or here (USA). The wonderful thing about the Sheffield Children's Book Award, is that the winning books are chosen by children. Many children from lots of different schools. There were a lot of children at the awards ceremony, and when Jonathan phoned me this morning to tell me about the Pig's Knickers winning two prizes, he related that when our books title was announced, there was the most enormous roar of cheering from the children, it must have been wonderful to have heard it. It must have been pretty wonderful and funny to see Jonathan accept the award in a big pair of polka dot knickers. Hello! Spring IS in the air isn't it? YES. Definitely, you can smell it. There's only one word for it, hurrah! On a completely different matter, Hugo came home from work last night, asking for the baby photos. "The baby photos?" I asked, mystified. He meant Ellie's baby photos. That is, our first-born dog. Apparently someone at work wanted to see Ellie as a baby (actually, that should be puppy really shouldn't it?). So he took the album (yes, we have an album of puppy photos) in to work, and apparently they went down EXTREMELY well. For loving dog owners, showing the photographs of your dog as a baby, ahem puppy, is a bit like proud parents displaying pictures of their children, there is only one response, and that is compliments. People who don't have pets, and some who do, often don't realise this, and just as with proud parents not receiving the suitable response to their adorable children's photos when they're showing them, folks who don't say nice things about precious pets are well................. a bit............. suspicious. I'm always very effusive about other peoples children (it's genuine), but I'm always slightly perturbed when people aren't effusive about my doggies. That's "batty over our dogs" owners for you. We never fully understand why our dogs aren't treated the same as humans. I'd better stop before I get really carried away on the subject of my dogs, because today I meaning to show you the last book I illustrated. It was published in August of last year, but I never got round to showing it to you. This book tells the story of Pig, who has a case of low self-esteem. He thinks all the other animals on the farm look ever so cool and wonderful, and that in comparison, he, Pig, is dull and dowdy. His life changes when a pair of knicker's from the farmer's washing line blows on to his head. (Just as an aside, and this isn't in the story, my life would change too if a pair of large spotty knickers landed on my head). Pig is amazed by the knickers. He eventually works out how to wear them................. and then he's AWAY! There is absolutely no stopping him. Well, wouldn't you want to go prancing round in these knickers too? All the animals are, quite simply, astonished. Pig is a blissfully happy pig, and goes to bed that night the happiest pig that ever there was. But as is the way with life, and it's harsh reality, Pig's happiness couldn't last could it? No! when there is a goat around, you have to be careful. (It says in the story that Goat didn't know he was eating Pig's prized knickers, but I suspect he did really). All the animals are distressed by Pig's cries of anguish, and run to his side. After some questioning, they realise what the distress is all about. Pig reveals that the knickers made him feel special, (one of the lads, tip-top and all that). The animals then explain to Pig that it's not the knickers that made him special, it is Pig himself who is special. It's not what he's wearing, it's what is inside, him, his personality, not his looks and fashion sense. Ah-ha! To a pig like Pig, this is very reassuring. (Goat, as you can see, is feeling a bit guilty. In the final version of the book he has some notes, like he's whistling, coming out of his mouth). This isn't quite the end of the story. Despite all the advice from his friends to dwell on his internal qualities, rahter than his surface qualities, Pig decides not to let his loss of the knickers stop him, he's found something else, even better than the knickers, which will impress everyone even more. (Just to warn the more sensitive amongst you, this last image of the book is aimed at producing great hilarity amongst children. And apparently it does cause a lot of laughter among children, not always among adults). Sorry about the pixilation on some of these images, they aren't like this in the actual book. And why have I titled this post "Boris Johnson"? Well, when I was creating the character of Pig for this book, Boris Johnson, current Mayor of London, kept on creeping into my mind. I'm not saying that Boris Johnson looks like a pig, not at all. Boris Johnson is one of our more eccentric public figures, and from what I've seen of him on the television, a real character. I'm very fond of the little I know of him, he's very entertaining, has a poetic flavour to his meandering deliveries to the press, and looks rather, shall we say................ extraordinary? When I was drawing Pig, I thought of him as Boris, not Pig. Pig (or Boris), was an absolute joy to create. It's the first book I have done in which I could enjoy drawing a comic character. It was this book that made me want to do my very own characters, not directed by an author's words, and I'm sure it's this that led me to start doing my paper mache figures more seriously. When it comes to my paper mache figures I'm not constricted by someone else's words, my own imagination is the only thing constraining me, and that feels good! And just before I go and start the weekend, if you'd like to buy a copy of "The Pig's Knickers", it's available through Amazon, in the UK here, and in the USA here. Hello! I am, officially, a busy little bee, and I'm almost buzzed out. Knitting my fair isle dress has been done in moments of relaxation this week, which seem to have been few and far between. Good thing I enjoy being busy isn't it? Anyway, back to the fair isle shall we? It's not at all subtle is it! But I'm enjoying it, ever so, ever so much, letting go with the colour, going a bit wild. It reminds me of the hot colours you might find in a sari, colours that wake you up, spicy colours. What I always find when I'm doing fair isle, is that I have to knit an expanse of it before the colours start to pull together, and the pattern starts to gel. I think it's still at that "knit a bit more and it will start to work" stage. That's the way fair isle draws you in and gets you addicted, the "one more row and it will be even better" thing is gripping. That orange is a bit of a wild card isn't it? I'm having to keep a tight grip on the reins with that orange, it's a bit of a run-away, and I waver between allowing it to rampage all over the pattern, and being strictly an accent colour, it sometimes gets the upper hand, as you can see above. It's changed quite a bit since you last saw it in this post, hasn't it? I decided to unravel some of the orange, I felt it was too solid. I think the nice thing about fair isle patterns is the smattering and sprinkling of colour you get all over the pattern, and the process of dispersing bits of colour all over the place not only helps the colours to work together, but you also get an illusion that there are more colours being used, as you contrast different colours with each other. Well, I'm off to have a quick cup of tea so that I stay fully alert whilst driving to meet Hugo, who is due back from having done a weeks course for the RNLI, (the Lifeboat), who he volunteers for. Apparently there was two days of first aid, a day of jumping fully clothed, whilst wearing full lifeboat safety gear, into the water and having to swim (I'm sure it wasn't as simple as that), and a day learning how to fire fight, followed by assessments this morning. He had to fly there (Poole), and I have to pick him up in the car after about a half hour drive according to Hugo, forty-five minute drive by my estimation, I try not to get speeding tickets). The first 'Dear Father Christmas'. Hello dear readers! Thank you, thank you, thank you soooo much for all your comments on yesterdays post! So very nice of you to do that for me, because not only does it make me feel jolly happy, it's jolly good for the old morale. Us illustrators sit at home, alone, for long periods of time, and we don't get to hear much feedback about our work, so your feedback was priceless, thank you so much. I mentioned yesterday, that I was going to show you the first 'Dear Father Christmas' book today, didn't I? 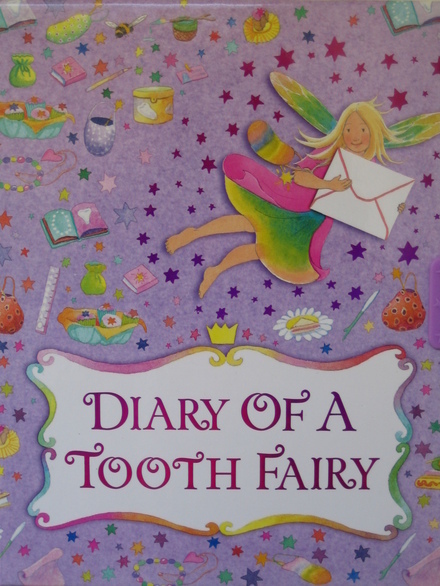 It was the book that inspired 'Dear father Christmas, Get Well Soon' (which I showed you in yesterdays post). I've done a few books since finishing 'Dear Father Christmas', but I still have a sharp recollection of listening to Christmas carols (to get me in the right Christmas mood), my studio being covered in Christmas decorations, and all my reference material being snow filled scenes. And that was when it was the middle of Summer. So when you look through the pages of this book, maybe you'll agree that I managed to enter into the Christmas spirit pretty well, all things considered. So shall we have a little look at the book? I think you might enjoy this one, well, I hope you do. It's the first of December, and Holly has written to Father Christmas with a query. She's seen someone in her local shopping centre, who calls himself Father Christmas. Holly wants to know if it was REALLY Father Christmas himself?! Now just as an aside, I was talking to a lady the other day, who went to Lapland with her children last year, and saw Father Christmas, went on a sleigh ride, and did other lovely things. Her son is old enough to remember this experience, and he remembers seeing the REAL Father Christmas. Well, when he sees Father Christmas in shopping centres and garden centres now, apparently he's totally dismissive of these 'imposters'. He tells his Mummy that he's seen the real thing, and I think he's a bit non-plussed by all these other chaps. So I can see exactly where Holly is coming from, and I'd be interested to know what Father Christmas has to say about this, wouldn't you? Let's find out! Aa-ha! I have the letter Father Christmas wrote to Holly, right here in my hand, and here is the answer. Those men are all Father Christmas's helpers! They are acting on his behalf, 'representing him', so-to-speak. Holly can't quite believe Father Christmas wrote back to her! And being the inquisitive girl that she is, makes the most of the fact that she has 'the ear' of Father Christmas himself, and writes back with more questions. In the picture above, we have an Elf collecting Holly's letter to take back to Father Christmas. You can see Holly's house on the left. At the time I was illustrating this story, there was a bit of a discussion as to how many Christmas lights I could put on Holly's house. Me being me, wanted to cover it in loads of sparkle. In the end, a compromise was reached, and I was allowed to put in what you see above. When it came to the Elf's trail of sparkle, I decided it was perfectly acceptable to have it SPARKLE. It is Christmas after all, and this is magic. If there was one thing I particularly enjoyed about illustrating this book, it was the world of father Christmas. The author, Alan Durant, wanted there to be many more spreads showing Holly's world, but there was one thing I wasn't going to pass up on showing, and which in my book is far more interesting, and that is the world of Father Christmas. Shall I get back to the story now? Holly receives another letter from Father Christmas, answering Holly's questions. But in the envelope with father Christmas's letter is something extra EXTRA special! An Advent Calender! 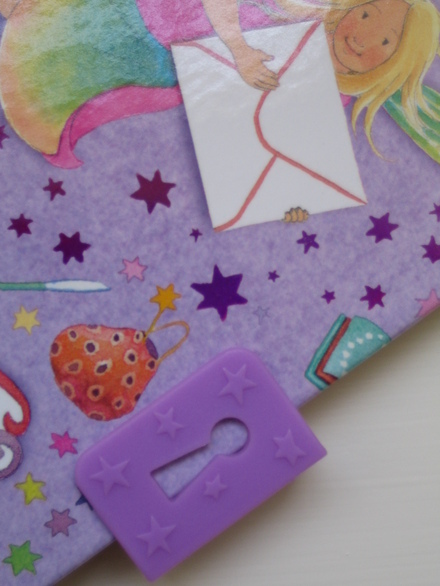 A tiny Advent calender that really works! You can open up each little window every day, and there's a picture! WOW! Not bad as freebies go hey? I would so like to go into Father Christmas's office! I think the picture above might be fulfilling that wish. 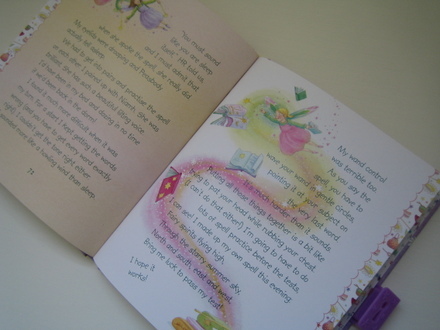 Father Christmas, in his letters, keeps on asking Holly what she would like for Christmas. She knows what she wants, but she doesn't dare ask. As a divirting tactic, she keeps on sending letters with questions in them instead. It's a good thing Father Christmas is such a nice, patient person, isn't it? You get the exact same ornament from Father Christmas that Holly is holding in the picture! How GREAT is that?! You too can put the ornament on your own tree. (And being such a stickler for detail, I made sure I painted a back view of Father Christmas too). Holly at this point, is trying to pluck up the courage to ask Father Christmas for what she really, really wants. But that's not before she's asked a few more important questions. Father Christmas was busy feeding the Reindeer some special treats, when the Elf arrives with Holly's latest questions. Among other questions she asks, Holly wants to know if Father Christmas really does like mince pies. Good question that, very good question! I wonder, does Father Christmas REALLY like mince pies? Well, if you have been leaving mince pies out for Father Christmas, year after year, and you're momentarily concerned he doesn't like them........................ he does! He loves them! And the Reindeer love their carrots, so don't forget them this year. In Father Christmas's reply, he gently reminds Holly that time is running out, and he would like to know what she'd like for Christmas. In with the letter, father Christmas pops something rather fab. A Reindeer guide! How cool is that? It folds out, and on both sides it's jam packed with things you might like to know about Reindeer, highly entertaining things of course. On one side of the fold-out, you get to know what makes a Reindeer laugh. I've always wanted to know that, and now I can. Would you like a quick peek at what makes a Reindeer Laugh? I had such FUN drawing and painting these Reindeer doing their crazy little things! I was given the jokes, and I had to come up with the pictures, there were no directions as to what to draw and paint, as with the whole book. At this point, I've realised I forgot to photograph the next spread. It's a real shame it's too dark to photograph it now, because it's a magical scene. From a distant vantage point, you get to see the top of the mountain Father Christmas's house is built on. And spreading out below the house are all the little cottages the Elves live in, with the lights on, casting lovely reflections on the snow. And all the Pine trees amongst the cottages are decorated with fairy lights. The little street lamps are lit, wisps of smoke come from the chimneys, and there are tiny footprints in the snow, leading from the Elves cottages up to Father Christmas's house. You can also see the tiny silhouettes of the Elves, waving to Father Christmas in his sleigh, and the Reindeer, as they set off on Christmas eve. And now for the next picture. Father Christmas has arrived at Holly's house, and he's brought Holly her present! It's a ticket, and he's holding it in his hand, in the picture above. It's a ticket for 'one sleigh ride'! I can not believe it, I've bloomin well not photographed the sleigh ride! I'm so sorry, this wasn't done on purpose to tantalise you, I don't know what happened, I'm really sorry about this. Well, the missing picture is a magical scene of Holly on the sleigh with Father Christmas, woolly hat, mittens and scarf on, tucked up under her own special blanket, speeding through the night sky as the reindeer pull the sleigh along. When Holly returns home, she realises she hasn't been dreaming, because there is an envelope at the bottom of her bed, and when she looks out of her window, she can see Father Christmas speeding off into the distance. Holly's wish, that she dared not ask, has come true! And what's in the last envelope? A little piece of magickery. It's Holly's ticket, as areminder of her sleigh ride, and on the front is the above picture. And the image MOVES! You turn it this way and that and the figures wave, and the Reindeer nod their heads, making the stockings sway back and forwards. I understand the technical term fro this wizardry is a 'Lenticular'. It was a HUGE amount of fun illustrating this story, and I put an enormous amount of work into it, making sure I paid attention to the tiniest detail. I think my favourite gift in this book is the Lenticular, there's just something magical about an image that moves. Just in case you're intrigued by this book, and fancy owning a real life copy, with all its magical bits'n'bobs inside, I can show you where to find it on Amazon. For Amazon U.K. you can find the link here (hardback copy), or here (paberback copy). And for the United States Amazon, there's a link to it here (paperback copy), here (mini edition). I think I might be ready for a warming Sherry, sitting by the wood burning stove downstairs. I do hope you enjoyed this bedtime story?! It's made me feel very Christmasy indeed, I can almost hear jingle bells outside................... Maybe I should look out of the window? What do you think? Have a lovely weekend, my dear, dear readers, and see you next week! Hello dear readers................... is it still too early to mention Christmasy things?! I imagine it is for some, but not early enough for others. Well, I'm going to risk going in at the deep end, by showing you my latest book, published in October of this year. The book ends with the pop-up you see above, quite a dramatic ending don't you think? Maybe I should start at the beginning, rather than the end. This book is a follow on from the first Christmas book I did, "Dear Father Christmas", or "Dear Santa" as it's known in the States. 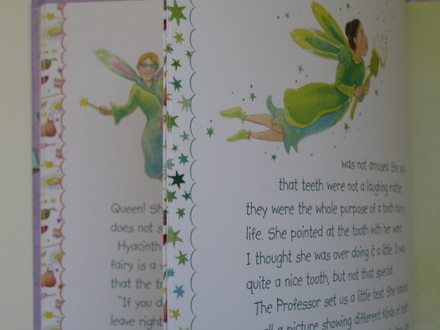 Apart from the story and illustrations, they both have a lot of little envelopes inside them, which contain extras, exciting extras. I don't know about you, but when I'm shopping for books on Amazon, I always find it frustrating that I can't have a flick through the book I'm interested in. A few times, I've bought a book, thinking it looked great because the cover made it look great, and then when I receive it in the post, I'm a bit disappointed. So I thought I'd show you a wide selection of pictures, and those little extras, from my new book, "Dear Father Christmas, Get Well Soon", to give you a good idea of what the content is like. 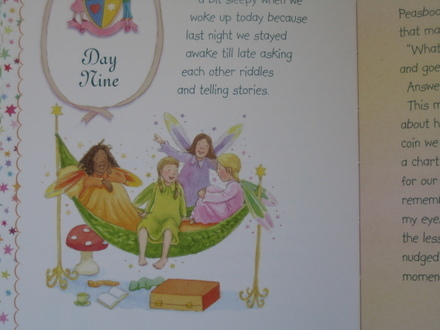 The above picture is actually the second spread in the book. Holly has woken up to find Father Christmas has left her a letter at the bottom of her bed. Holly's delighted by this, as she and Billy (her little brother), were getting very excited about the arrival of Christmas. There is just one fly in the ointment, the letter in the envelope is actually written by a Christmas Elf, saying there's an emergency, Father Christmas is unwell! The Christmas Elf begs Holly to write Father Christmas a letter to cheer him up. 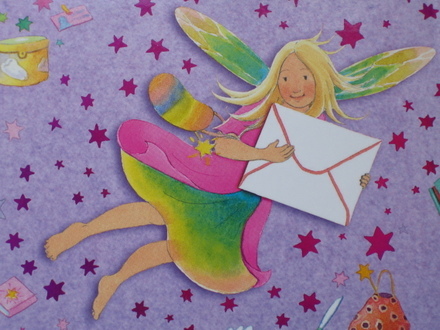 Holly, being the obliging little girl that she is, writes back to the Christmas Elf, and you get to see her letter , next to the picture above. Holly also wants to know what the Elfs name is. (Quite right too). That night, the Elf flies in to pick up Holly's letter, and takes it all the way back to Lapland. It's actually a pop-up card, on which Elf reveals his name to be Harvey. There's Father Christmas, sitting in his armchair, reading Holly's letter. And just look at all those letters he still has to read, stacked up on the mantel piece. There's not a moments rest for him this time of year, is there? And Harvey, in his letter, tries to push his luck a bit (if you ask me), and asks Holly to help out with getting all the presents ready! The next day, Holly finds the time to write back to Harvey, despite a busy day of putting up the Christmas decorations. Holly's letter cheers up Father Christmas no end. After seeing to it that Father Christmas is comfortable, Harvey attends to his chores, and then sits down to write a reply. His special Christmas recipes! Well! Who'd have thought, cooking tips from an Elf, it really doesn't get much better than that, does it? There are more recipes on the other side of the folding card too. Holly loves Harvey's letter, and the recipe book, and she can't wait to tell Harvey all about how they got their Christmas tree. Holly even bakes Father Christmas a biscuit/cookie. Oooohh! Some stencils! Harvey thinks Holly might like to use them to make her own Christmas decorations. It's now only two days till Christmas, and there's snow outside! Yipee! Holly and Billy are watching carol singers from their window, everything is simply magical. But little does Holly know that things are soon going to get even better. Meanwhile, "back at the ranch", everyone is panicking. Elves are running about madly, trying desperately to finish gifts, wrap them, sort them, and generally get organised. But look who's up and about! It's Father Christmas! Phew. He still feels a bit wobbly though, and is worried he's going to let all those little children down, there are lots of people who depend on him. Can we see what's going on to the left a bit please? When Harvey hears that Father Christmas is worried, and a little bit miserable, he knows he needs to act fast. Off Harvey flies, into the night sky. Well! What a surprise when Harvey returns home! He's brought Holly with him to cheer up Father Christmas, and help him on his round of gift giving. Father Christmas is positively thrilled to see Holly. It will make the long night ahead much more bearable, having Holly there to help him. All night long, they go from house to house, landing on the rooves of houses, and having a very jolly time. I imagine they get quite full from all the treats people leave out for them. The last house they come to is Holly's, and they have to leave her here. No doubt Holly will be glad to get to bed. And how does this story end? HAPPILY! Yes, Father Christmas feels much better, and of course, there's all the gifts to be given to the Elves, to look forward to, and a nice hot cuppa and a bite to eat no doubt. Oh I do like a nice reassuring story, and at this time, it's always nice to have a bit of glitter and sparkle too. This last spread of the book has a bit of the wow factor when you open it up. I didn't do the paper engineering for this, a special paper engineer did all the pop up miracle stuff, but I did paint everything. When I was painting the house, I wanted to take full advantage of the fact that you can actually peer into the windows. Oooohh look! The Elves are waving at us! Wonder what those Elves in there are chatting about? Here's some of Father Christmas's welcome home party, bet they're relieved to see him home safe and sound. I do likethe idea of being able to physically look aroud a scene in an illustration, and with this pop-up, you really can do it! I remember as a child, turning books this way, and that, trying to see behind a figure, or round a corner, and getting very frustrated at the limitations a two-dimensional picture presented. The Reindeer, and all the figures in front of the house, incliding the sleigh, have their back views painted (very important the magic doesn't stop with the front view). So you really can turn this picture this way and that, and have a very good nosy, without getting frustrated. The only drawback about this picture, is that the figures don't come alive and move around in the snow. Shame. You'll just have to imagine the stomping of Reindeer feet, the snorting of Reindeer noses, the excited chatter of the Elves, and the ho-ho-ho's of happy Father Christmas. Now you've seen an abbreviated version of the story, and a selection of pictures, what do you think, would you like to see the full version? I just looked on Amazon, and it's very reasonably priced, and I have to say, what with all those extra treats, exceptional value for money. You can find it on Amazon for the U.K. here. And if you're in the States, you can find it on Amazon here. I was going to show you the first Father Christmas book, but I think that's probably enough for now, I'll show it to you tomorrow. It feels a little like I've just read you a quick bed time story! And what does one say after closing a book? Time to go to bed now, night-night. 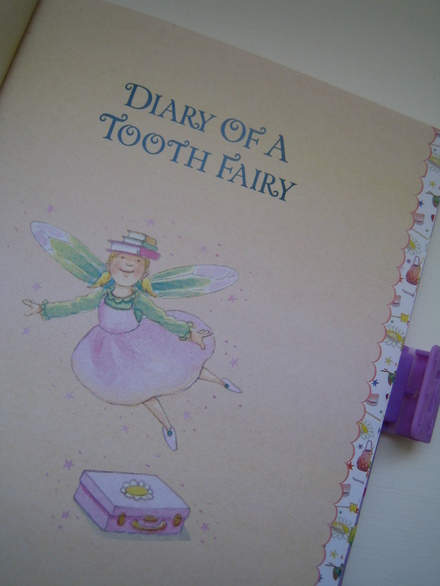 Diary of a tooth fairy.